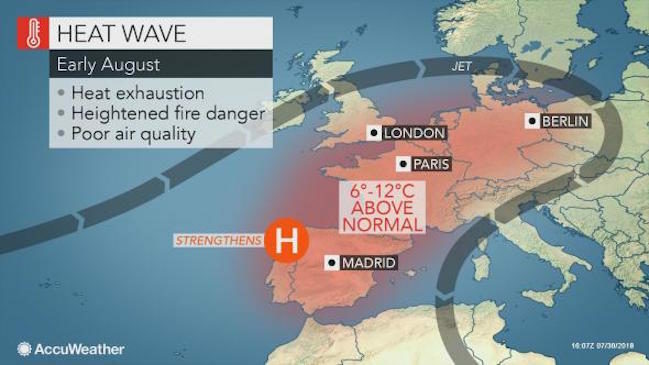 Dangerous heat is expected to expand across western Europe for the first week of August. While the core of the heat was focused around Germany on Tuesday, temperatures will be on the rise elsewhere across western Europe Wednesday into Friday. Highs on Friday are anticipated to range from 31 C (88 F) in London and Berlin to 35 C (95 F) in Paris and 40 C (104 F) in Madrid and approaching 43 C (110 F) in Seville, Spain. Temperatures will continue to soar 6-12 degrees Celsius (10-24 degrees Fahrenheit) above normal in most of these cities through at least the weekend. 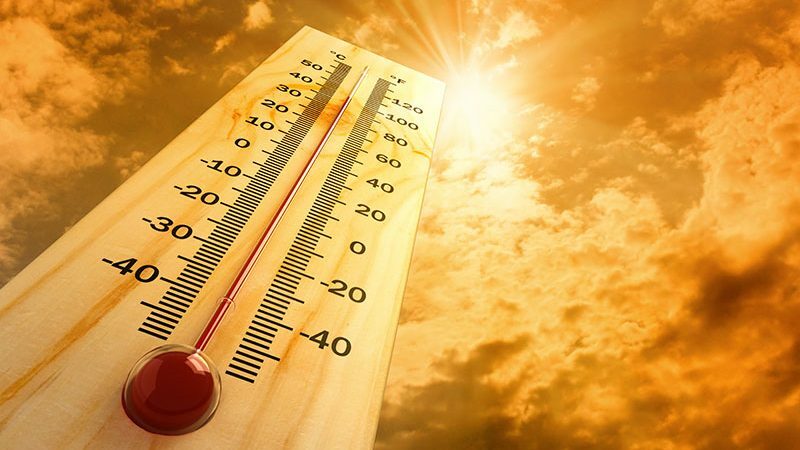 “It is not out of the question for temperatures to reach 49 C (120 F) in southwestern Spain and parts of southern Portugal Friday into Sunday,” AccuWeather Meteorologist Tyler Roys said. The impending heat wave is expected to be the most intense and longest for the Iberian Peninsula so far this summer. Temperatures in Madrid have only reached 38 C (100 F) once so far this summer. Such temperatures are anticipated daily from Wednesday through next Tuesday. “In southwestern France, temperatures can climb to 43 C (110 F) in a few communities this weekend,” according to Roys. Be sure to drink plenty of water, wear light clothing and avoid strenuous activity during the midday and afternoon hours (the hottest times of the day) to prevent heat exhaustion or stroke. Residents should ensure that the elderly, children and homeless are taking the necessary precautions to keep cool. Make sure that animals have proper access to water and shade. Remember to never leave children or pets in a sealed vehicle without air conditioning. Sunshine can cause such vehicles to become death traps in a matter of minutes. Deteriorating air quality can further put a strain on residents. That is especially true in the vicinity of any wildfires, according to Roys. The heat may help to fuel severe thunderstorms across western Poland, Germany and into Switzerland on Wednesday afternoon and evening. Drier weather will return to these areas, away from the Alps, by Friday and hold into the weekend. Any thunderstorms elsewhere from southern England to the Iberian Peninsula during the first several days of August will be very isolated and can do more harm than good. Lightning strikes outside of where it is raining can spark wildfires. Residents should use caution with cigarette butts, campfires and other equipment that produces sparks as dried-out grass can provide plenty of fuel for wildfires. Tinder dry vegetation, low relative humidity and local breezes can put the interior of the Iberian Peninsula at a higher fire danger than other parts of western Europe. The heat is expected to hang on into early next week. While the peak of the heat may be over by midweek, it can still be warmer than normal in most areas.